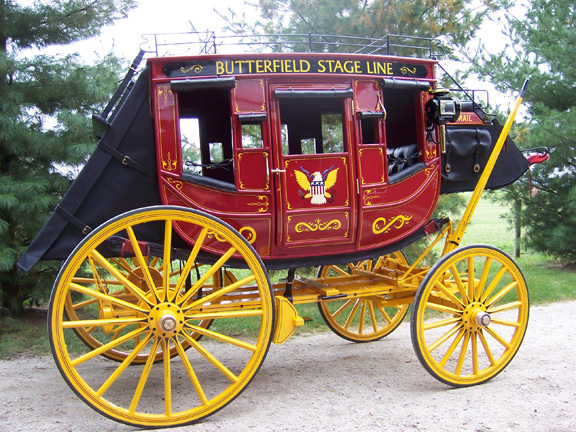 The famous Southern Overland Mail Route, better known as the Butterfield Stage in romantic Wild West movies, actually operated its twice-weekly mail and passenger service for less than three years from September 15, 1858 until March 1, 1861. Two trails from the east started from St. Louis and from Memphis, Tennessee. When the trails met at Fort Smith, Arkansas, they joined and continued west. The line swooped south through Indian Territory (present Oklahoma) in what was called the “Ox Bow” to avoid the snows and mountain passes of the central regions of the country. The stages crossed the Red River into Texas on Colbert’s Ferry near present Denison and headed west for the 740-mile, eight-day trip to Franklin (present El Paso). The stages ran night and day averaging speeds of five to twelve miles per hour. Primitive stations offering water and a change of horses lay about every twenty miles along the flat, desert-like trail and were spaced between stops at Fort Belknap, Fort Phantom Hill, and Fort Chadbourne. The route crossed the Pecos River, skirted the base of the Guadalupe Mountains, and reached the dividing point between the route’s east and west divisions at present day El Paso. Concord-made coaches weighing more than two tons were replaced by lighter-weight “celerity” or mud wagons and the team of four to six horses stepped aside for mule power that proved to be a lot less attractive to Indians. The mud wagons had light frames that made it easier to maneuver the deep sands and mud. The roofs were made of thick duck or canvass and the open sides allowed the free flow of air as well as dust and rain. Until Congress authorized the U.S. postmaster general to offer a contract to deliver mail from St. Louis to San Francisco, all mail bound for the West Coast had to be shipped through the Gulf of Mexico, freighted across the Isthmus of Panama to the Pacific and shipped up the coast to California. John W. Butterfield and his associates won the U.S. government contract in September 1857 to haul mail and passengers across the southern part of the country to California. It took a year to assemble the necessary equipment–a huge investment in 250 Concord Stagecoaches, 1,200 horses, and 600 mules. They dug cisterns or water wells and built corrals at 139 relay stations and hired 800 employees, including drivers, conductors, station keepers, blacksmiths, and wranglers. The government contract called for the Butterfield Overland Stage Company to receive $600,000 a year, plus the money it earned on passenger fares and the receipts for mail. Postage cost ten cents per half-ounce and passengers paid $200 for the one-way 2,795-mile trip. The coaches departed each Monday and Thursday morning in the east from near St. Louis and in the west from San Francisco for the 25-day journey. I am looking forward to reading your report. I find the images very interesting. Thanks for sharing. Usually five or six passengers traveled in a coach; however, more could be squeezed in or mailbags could be shoved in beside the passengers. Ormsby, the newspaper reported said after three nights without sleep, he finally had enough space to stretch out and he completely forgot the banging of his head and bouncing. Myra, how many passengers could fit in the coaches and mud wagons? It looks like four or six would be the maximum. Twenty-four days of Hell, indeed!